Computer users nowadays know how important it is to keep their systems safe, but, at the same time, unfortunately, cyber criminals also know that users are interested in applying various security applications. Therefore, there are things like Security Alert that sound as if they can protect you from harm but in reality cannot. You should not use this application, because it is a mere adware program that will bombard you with annoying ads and expose you to corrupted websites. It would be in your best interests to remove Security Alert from your computer immediately. For manual removal instructions, please scroll down to the bottom of this description. To be honest, we know enough about Security Alert without even looking too deeply into it because it comes from a family of adware applications we have seen before. Our security experts suggest that Security Alert is practically identical to Finance Alert, Breaking News Alert, Celebrity Alert, and other similar programs. In other words, Security Alert promises to provide you with some useful function, but in reality it does nothing to improve your web security or your Internet browsing experience. It says that with Security Alert you can be “alert to news in the world of Internet security,” and supposedly with this knowledge you should be able to keep your PC safe. Unfortunately, it is not as simple as it might seem. 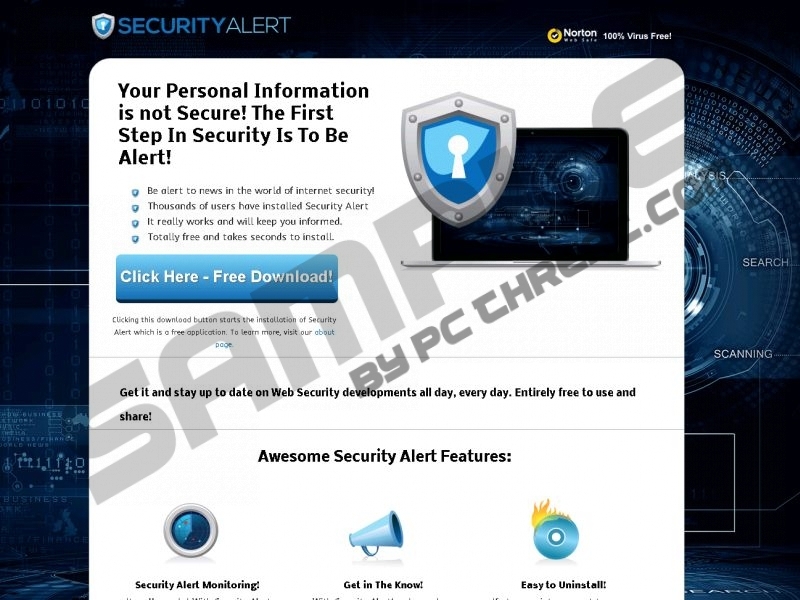 It is true that you can download Security Alert at getsecurityalert.com, but it is clearly not the only distribution source for this adware. The fact that the direct download link at the main website works perfectly suggests that Security Alert is not a malicious computer infection. But, of course, we never said it was. Nevertheless, as a free application it needs to support itself somehow, and Security Alert does it by displaying commercial advertisements. The information provided at the main website says that Security Alert “is entirely free to use, but may show advertisements while Security Alert is installed. These promotions help us keep Security Alert 100% awesome and free for you.” The problem is that this application does NOT review what kind of content gets embedded in the aforementioned ads. In case cyber criminals decide to exploit Security Alert for their malicious purposes, the program may become a gear in a humongous malware distribution mechanism. This is definitely a security threat you should avoid, and your best option in this situation is removing Security Alert right now. The app does not have any extensions, so you won’t need to delete any plug-ins from your computer. However, you should seriously consider investing in a licensed antispyware tool that will help you scan your computer and protect your system from similar intruders in the future. Open Uninstall a program and remove Security Alert. Go to Uninstall a program and remove Security Alert. Select Add or remove program and uninstall Security Alert. Quick & tested solution for Security Alert removal.